Another view of finished main body. One problem I found out the hard way is that a chemical in some brands of duct tape inhibits gelcoat curing. In the end, gelcoat that had been in contact with some kinds of duct tape never fully cured and had to be cleaned out with acetone. Also, the joggles formed with duct tape were too sharp for the fiberglass mat to conform to, resulting in bubbles under the gelcoat that have to be scraped out and reworked. Gelcoat is probably more trouble than it’s worth given its weight, so next time I’ll just prime and paint the body panels to finish them. The sharp joggle corners need to be filled in with fiberglass roving before laying mat on top. Fiberglass mat for leg cover. Finished leg cover, fresh from the mold. No polishing or anything. Leg cover test fit onto frame. It fits. Engine cover test fit on frame. Nose & tail fiberglass mat test fitting. Nose & tail second layup coremat and fiberglass mat. Finished tail fresh from the mold. Nose & tail trimmed. Needed some gelcoat repair. Tail test fitted onto engine cover. Cockpit ridges reinforced with resin and chopped fiberglass mat. Cockpit removed from mold. A little difficult as it could only be pulled straight off. Cockpit so light it’s held up by a pinky finger. Sidepod after second layup, showing coremat. Sidepod just released from the mold. Sidepod test fitting before trimming. Keel mold ready for layup. Note duct-tape joggles for panel overlap. Keel mold with gelcoat applied. Keel after second layup showing coremat. Main body parts all finished and fitted. Joint between engine cover and cockpit. Four body panels meet here. Joggles required some thinking. Body from inside the cockpit. 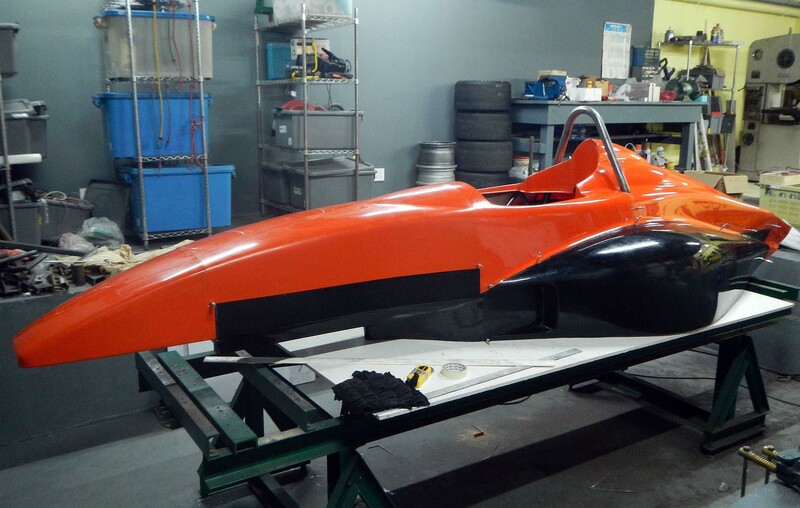 This entry was posted in Body, Fiberglass, Fiberglass and tagged body, fiberglass, formula 1000, gelcoat, layup, race car. Bookmark the permalink.